The major works of compadres G.K. Chesterton and Hilaire Belloc have been widely circulated in the past few decades among an expanding circle of Catholics seeking a more universal knowledge of our Christian perspective, history and faith. At this time Loreto Publications cannot carry these treasures of wisdom, which are voluminous (Belloc wrote about 150 books), however a good supply can be obtained from other Catholic publishers. What we have chosen to do is periodically promote certain of their productions which we feel are particularly timely and potentially formative. Outline of Sanity and The Free Press preeminently qualify as fare for any soldier whose enlistment in the Church militant is more than perfunctory. 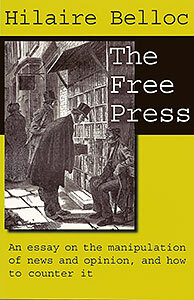 The Free Press is a new release from IHS Press. It was written in 1917, the same year Our Lady came to Fatima. The media’s manipulation of thought among the masses, which Belloc warned about back then, by the financial power elite (motivated by capitalist interest rather than truth) has grown exponentially over these last four score industrial and technological decades. Yet this eighty page essay is not a wailing sheet of moral nor intellectual despair. The mighty author was too much of a Catholic, too much a man of hope, to see nothing but gloom and darkness on the literary horizon. He saw the press as a most salient force on the battlefield of ideas — not only in 1917, but in any future time as well. Those ideas which are true, and therefore good, must win out in the end. The truth, by its very nature, is productive — be it public news (i.e., what is due to the social man) or commentary; whereas the lie (and all dissemblance of reality) is destructive. If there is an organ for truth, for justice, issuing regularly printed daily sheets, no matter how hampered by the enemy, influential thinkers will gravitate to it like a magnet. Its writers will be more eloquent, for they shall have a cause that is not enslaved to money and its pathetic and corrosive cancer of the soul commonly known as mediocrity. 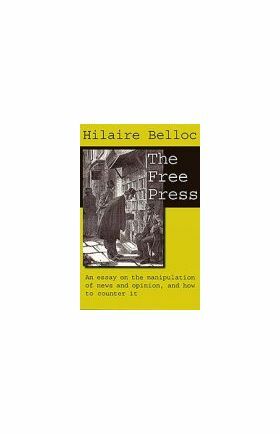 Belloc was absolutely confidant that there was more power in his weekly Eye Witness political journal reaching one reflective reader than in that of the Daily Telegraph or the Times reaching one thousand dullards. The reader should note that by the term Free Press the author is in no way championing the Masonic catchphrase (which is a deceptive abuse of the ideal of true "freedom" — a common ploy of all tyrannical tricksters), rather he intends the word to mean exactly what its definition implies. This book gives hope to all of us who are engaged in the apostolate of the written word. We can win. We will win! Ironically enough, though it may not appear evident — today’s orchestrated media bias notwithstanding — we are winning.